We’ve all heard the old saying that it takes a village to raise a child. Today, I wanted to write about what my experience has taught me about what it takes to build a village. Several years ago, I was offered a chance to move to the South Sound area to work on Cascadia, the largest master planned community in Washington. I’d be a project manager for an engineering team supporting the 4,700-acre project. There were just two problems: the project was in bankruptcy and it was so soon after the housing bubble burst that you could still hear the echoes. Still, my wife and I packed up our family and hit the road with our fingers crossed. New ownership, rebranding, and years of hard work brings us to Harvest Day 2018. 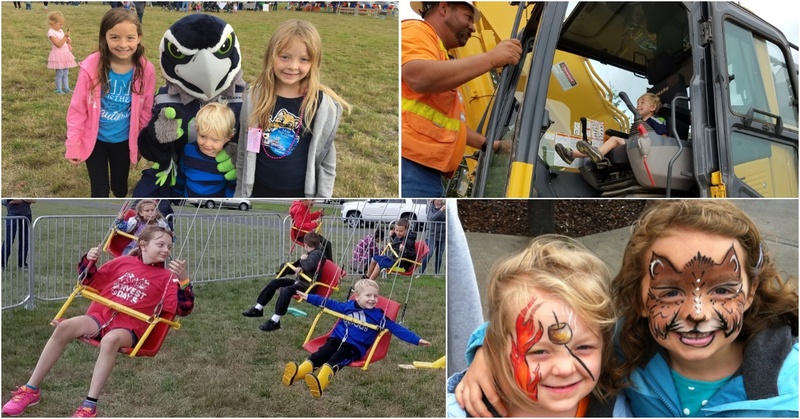 Tehaleh, by Newland Communities, celebrated their sixth anniversary with an event called Harvest Day when the community comes together for trail runs, games, food trucks, a beer garden, and a vendor village. It was interesting to think back on the first Harvest Day when there were just a handful of model homes. Now, Tehaleh has 3,800 residents and is growing by 300-350 homes per year. It has been amazing to watch this bustling community grow out of the woods, but behind the scenes it has been remarkable to see how this tremendous success has been accomplished. Obviously, there’s not a simple formula for how to make a project succeed, but today I wanted to write about three key factors. In order to build a village you must 1) keep an eye on the big picture, 2) assemble a skilled team, and 3) build relationships of trust with agencies and the community. Wrapping your head around 4,700 acres of master planned development is no small task. Some back of the napkin math says that when Tehaleh is all built out it will have nearly 100 miles of roads, storm, sewer, and water pipe, and 100+ acre-feet of stormwater storage. Since it is entitled for 9,700 units, even a take down of 300 lots per year stretches it into a 30 year project. Yet, while focusing to meet this year’s business plan, one cannot lose sight of the 30th year. This year’s project must include the necessary infrastructure to accommodate future projects or the result will be costly rework, and/or a reduction in the overall yield. Either of those options means you’ve met this year’s business plan at the expense of future years. I’ve had the privilege to work with some really sharp people. Their strengths and abilities vary widely, but their collective skills help keep things on track. In a less than comprehensive list I came up with 14 different companies who consult on Tehaleh. This group represents different specialties, they focus on different issues, but together they’re looking out for the well-being of the overall project. While you need specialists to address the detailed needs of a complicated project, I’d also recommend having a few that are involved in everything. Like I mentioned above, the big picture is a lot to take in. Having a cadre of individuals capable of processing all the information gives you that many more eyes, both on the present and the future. One line from any of your specialists' reports may have far reaching impacts, and you need people without project blinders to help you process and track those impacts across the entire project. Too often developers try to bully a project into existence, but Newland Communities has developed a team approach to working with the various agencies. They recognize that Tehaleh is not a one-and-done project that can burn bridges that need to be crossed multiple times each year for the next decade plus. There is not an us-versus-them mentality, but instead they recognize that we’re all part of the same community. This isn’t just a quaint notion, but actual fact, since many of Newland’s team of consultants and contractors live in and around Tehaleh. Being invested in the larger community and recognizing that a master planned community is a long term commitment should lead you to conclude that your relationship with review agencies should not be adversarial, but rather you should work towards one of trust. If you cut corners or try to slip one past the agency, you will pay the price long into the future. However, if you operate in good faith, and earnestly strive towards an outcome that works for everyone, then you will gain the agencies’ trust which will pay dividends year after year. It means smoother reviews, more flexibility in design standards and wider acceptance of your project in the community at large. Like I said before, there is no simple formula, but my work at Tehaleh has taught me that by keeping an eye on the big picture, assembling a skilled team, and building relationships of trust with agencies and the community lays the foundation to build a village.